There is nothing nastier than a dirty oven, unless it’s a dirty microwave that has cooked foods and pizza uncovered. Discover how to clean your oven and learn how to clean your self-cleaning oven when it has left ash in the bottom and some stubborn crusted bits all over, after it’s been clean. Even if you have a self-cleaning oven, it will not be 100% clean and you will need to use a bit of your arm and hand power to finalize the cleaning. I let mine self-clean for about 5-hours to remove most of the grime. Then I wipe out the ash on the bottom. The first self-cleaning oven was developed in 1963,—55 years ago by General Electric (GE), pioneers and innovators in home appliances. It was called the P-7. The ‘P’ stands for pyrolytic and the ‘7’ is the number of Kilowatts (7000 Watts) of power used to clean the oven. GE received over 100 patents for it and it’s still sold today under different model names. When you go to check out new cooking stoves, remember the self-cleaning feature is only about $100 more and it is well worth it. You know when your oven is dirty. It will have run-over pie juice on the bottom that turns black from burning and it has grease all over the sides, top, oven door with or without see-through glass. You might even start a fire in the bottom when you turn the oven on and you never want that to happen. The one thing you do not want to do is leave your oven racks in the oven when it is self-cleaning. Why? Because the extreme 900-degree F. (500° C.) heat will ruin the stainless-steel coating. Then they are dull losing their shine and will never slide out freely again ever! They will bind and hang on the groves they slide on. 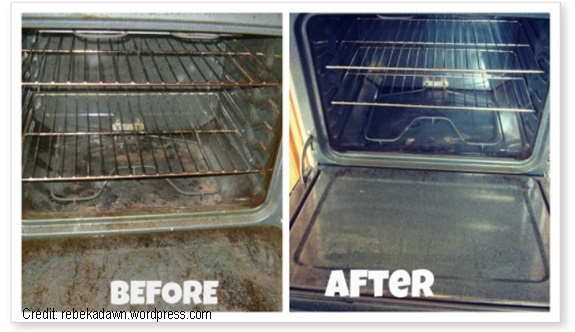 Read more below for learning how to clean your oven be it not self-cleaning or self-cleaning. These are the reasons I own a self-cleaning oven. 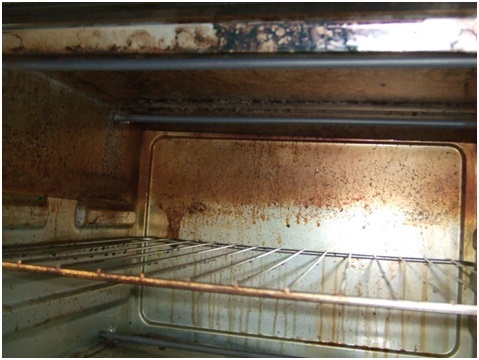 Cleaning an oven that does not clean itself is labor intensive and expensive if you buy chemicals. You will use manual labor and spend many hours doing so. Chemical fumes are toxic, strong, stink, and require rubber gloves, eye protection, and maybe a mask using room ventilation opening the window, using a ceiling fan if you have one, or the hood vent. With a self-cleaning oven, you do next to nothing. The high temperature will burn off the gunk inside your oven and leave a small ash pile on the bottom when finished. You save your valuable time doing other things while the oven is cleaning, which is about 4-hours depending what you set the timer for. Don’t clean your racks, sometimes called grates, during the self-cleaning function or they will be ruined and you will be so unhappy. Soak the oven racks in the bathtub in detergent and water as hot as it will go overnight. 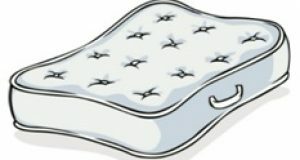 The next day, use an old cotton cloth (not paper towels) and start wiping them. You might need to use an old tooth brush or wire brush. 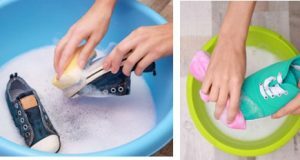 You might need to soak them again in more detergent. It only takes an inch or two of hot water to cover them. When the racks are clean, rinse well, towel dry, and lay them out on the grass in the sun if that’s available. Then put them back in your clean oven after you’ve removed residual spots and ash. Keep children and pets away from the kitchen while the oven is cleaning, since it heats to a very high temperature and tends to give off a burning smell. The stove can be very hot on top. I remember the days before self-cleaning ovens using Easy-Off® that is still good to use today on ovens. It’s good to clean off those leftover bits after your self-cleaning oven has finished its task yet leaves some spots. I would spend hours on my knees reaching in, around, and up before I owned a self-cleaner. This heavy duty oven, broiler, and barbeque grill and smoker cleaner in the yellow container will clean tough baked-on spills quickly. 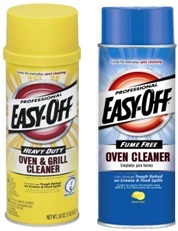 Or use the Easy-Off® Professional Fume-Free Max Oven Cleaner, lemon scent in the blue container. It takes a little longer but there will be no fumes. It’ a best seller on Amazon.com®. You can make a paste of baking soda and water and let it soak all over the interior of your oven while the racks are soaking in the bathtub discussed above. Make a lot of it in a plastic container to be a paste that you can move about. Let it sit overnight and clean it off in the morning. 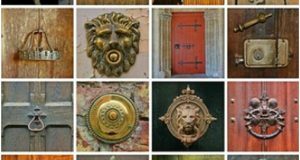 If grime and food are still there, use more baking soda paste. If the baking soda did its job, put vinegar, and water into a spray bottle and wipe down to kill any microbes hanging about in your clean oven. Towel dry with a large cotton rag or old bath towel. Leave the oven door open for a while to air dry. I’ll keep my self-cleaning oven where the oven door latches so no one can open it. It’s fast with very little work from me. Never leave the house when it’s running. Another alternative is using a steam cleaner. The video shows the woman is putting forth little effort and actually enjoying her success. No chemicals are used either. The HomeRight® Steam Machine is truly a marvel using only hot water! I like this for the best way to clean ovens. This machine will also clean floors, windows, bathrooms, and more. It’s a top seller on Amazon.com® and comes with 17 accessories. 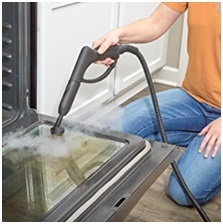 Use the wire brush attachment for cleaning your oven and glass door. Clean your oven with no harsh chemicals using the HomeRight® Steam Machine video. Clean your oven glass door very gently on the outside. I found that I have some “runs” of liquid inside the 2 glass pieces. I have no idea what it is or how it got there. It seems the seal could have gotten an air leak and condensation entered. I’m not about to fix it by putting on a new gasket seal. Let me know what method you used to clean your oven and how that worked out. Leave a question or comment in the box below for an answer from me.